The lower extremity venous system is composed of deep, perforating, and superficial veins. The common femoral, femoral, and deep (profunda) femoral veins, in addition to the popliteal and tibial veins, make up the deep system. There is a concerted effort to replace the once named superficial femoral vein with simply femoral vein to alleviate the confusion the term superficial implies when treating conditions such as DVT. The deep veins lie beneath the investing fascia of the muscles of the leg and thigh (the deep compartment). The saphenous veins have similarly undergone a change in name to the great saphenous (GSV) and small saphenous vein (SSV) to standardize the abbreviations that are otherwise extremely confusing. It has also become clear that the GSV and SSV lie within the superficial compartment and also within a saphenous compartment. The saphenous nerve lies within the GSV compartment jeopardizing injury during surgery, but if the associated sensory loss occurs it appears to have little impact on the patient’s quality of life. The sural nerve lies in close proximity to the SSV within its compartment. The superficial veins outside the saphenous compartment are called accessory saphenous veins if they lie parallel to the GSV or SSV. The term communicating vein is now reserved for those veins that interconnect with other veins of the same system, and the term perforating vein is reserved for those that penetrate the muscular fascia to connect superficial to deep. In the past, perforating veins with rather constant anatomic location have been named for their discoverer (e.g., Crockett’s, Boyd’s perforators), but more descriptive terms designating location are now preferred. The popliteal and femoral veins have variable anatomy and are often duplicated much like the tibial veins. The variability of the lower extremity venous system is well known, but only certain anatomic variations are of importance for current surgical practice. 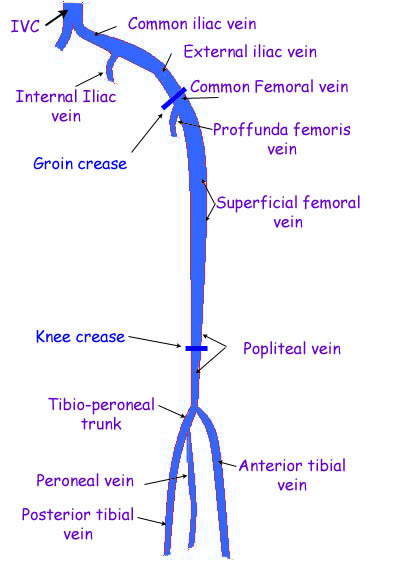 The deep femoral vein often connects directly or though tributaries to the popliteal vein. Although duplication of the GSV has been estimated to present in up to 50% of patients in some studies, it is becoming evident that duplications of the true GSV lying within the saphenous compartment may be less common. The saphenofemoral junction often has at least four branches in addition to the GSV but the arrangement and precise location of the branches is quite variable. The most cephalic branch is generally the superficial epigastric vein and is of some importance in new techniques for managing GSV reflux. The SSV is rarely duplicated (4%). Although the SSV appears to pierce the deep fascia in the upper third of the calf, in reality the membranous layer forming the roof of the SSV compartment is thickened while the muscular fascia disappears, which positions the SSV between the gastrocnemius muscle bellies. In only 62% of limbs does the SSV actually end in the popliteal fossa. The anatomy of the perforating veins becomes extremely important when considering surgery aimed at preventing reflux in the lower leg. Certainly, removing the GSV may not prevent the impact of perforator reflux if one ignores the fact that the posterior tibial perforators connect the posterior accessory GSV with the posterior tibial veins rather than forming a direct connection with the GSV. Similarly, not recognizing the presence of paratibial perforators can result in an unsuccessful operation aimed at preventing calf perforator reflux. With the exception of foot veins, the valves promote blood flow from superficial to deep and from caudal to cephalad in direction. The valves are made of a fine connective tissue skeleton covered by endothelium and are generally bicuspid, delicate, and extremely strong. The tibial and peroneal veins contain about 7 to 19 valves each. The popliteal vein contains one or two valves and the femoral vein has generally three. About 70% of common femoral veins have a valve located within 1 cm of the inguinal ligament. Twenty-five percent of external iliac and 10% of the internal iliac veins have a valve. The common iliac vein generally has no valves. Within like lengths of the superficial venous system when compared to the deep veins, fewer valves are found (approximately seven to nine in the GSV and SSV). Perforating veins and even larger venules have venous valves. The diagnosis of CVI is made primarily by physical examination. The accuracy of physical examination can be further improved with the aid of an instrument called a hand-held Doppler instrument. This allows the examiner to listen to the blood flow. The most accurate and detailed test, however is a venous duplex ultrasound exam. This provides an ultrasound image or picture of the vein so that any blockage caused by blood clots or improper vein value function can be detected. A CT scan or MRI may be used to exclude other causes of leg swelling. These diagnostic tests are painless. Varicose veins may be entirely symptom-free and cause no immediate health problems. However, when varicose veins are associated with CVI, the most common sign is ankle and foot swelling that progress up the lower leg. Other skin changes in the lower leg that commonly occur include discoloration, eczema, scarring or hard, thickened skin, and ulceration. When symptoms are present the most common are heaviness or fullness, aching, restlessness, tiredness, fatigue, pain, throbbing, burning, itching and muscle cramping. In advanced cases, breakdown of the skin may cause bleeding from varicose veins, and large varicosities may develop blood clots, a condition called superficial phlebitis or thrombophlebitis. If you experience any of these symptoms, talk with your doctor. Don’t ignore these symptoms. One or more blood clots in superficial or deep veins. Female gender, although varicose veins occur nearly as commonly in men. Limited physical activity, high blood pressure, and obesity have also been linked with the presence of varicose veins in women. The treatment of CVI involves both medical and surgical treatments. You should avoid prolonged standing or sitting. People with known CVI should elevate their feet above their thighs when sitting and above their heart when lying down three to four times a day if possible to reduce swelling. Structured exercise such as walking to strengthen calf muscles may improve calf muscle function. Leg compression is considered by most to be first-line therapy for all stages of CVI and has been found in some studies to improve quality of life. Most patients with swelling can use knee-length prescription gradient compression stockings. These stockings help to reduce the symptoms of varicose veins, prevent leg swelling, and decrease the risk of blood clots. Prescription stockings are more effective than over the counter stockings found on the shelves of supermarkets and drug stores. Compression should be avoided in people who have poor arterial circulation in their legs or neuropathy. Intermittent compression pumps may be helpful initially in patients with massive swelling prior to fitting of prescription compression stockings. Unfortunately, these devices are expensive, time consuming, and their benefits are not clear. Treatment of venous ulcers may require therapy through a wound care center specializing in the application of medical wraps, topical antibiotics and ointments, exfoliants, and growth factors. People with CVI and massive swelling may be initially treated with small doses of diuretics for up to a week, with very close monitoring. Diuretics have little benefit if used in large doses or long-term. Topical steroid creams may be used for temporary relief of eczema and dermatitis. Since topical creams may cause contact dermatitis, they should only be used on the advice of a physician. Oral antibiotics may be necessary for those with infection of the legs. This, fortunately, is uncommon. A variety of herbal supplements for use in patients with CVI are available in health food stores and via the Internet. Herbs and supplements are not strictly regulated by the U.S. Food and Drug Administration. Thus, the strength, purity and safety of these products may vary. The most common herbal supplement found for venous health is horse chestnut seed extract. This extract has been found to reduce swelling and pain associated with CVI in some short-term studies, but the long term benefit is unknown. Two other herbal supplements, micronized purified flavonoid fraction and French maritime pine bark extract have also been studied for the treatment of CVI. In prospective, randomized studies, only micronized purified flavonoid fraction showed increased healing of venous leg ulcers and reduction of leg swelling. Non-micronized flavonoids have shown no benefits. Sclerotherapy (injections of the veins) involves injecting a sclerosing solution or foam into spider, reticular, or varicose veins. This is a minimally invasive office procedure. Veins that are treated become sealed off, and over time, are eliminated by the body. Typically patients receive multiple treatments and most see significant improvement over the course of several months of treatment. Ambulatory phlebectomy is also a minimally invasive procedure that can be performed under local, epidural, or general anesthesia in an outpatient setting. Varicose veins are removed with small hooks through tiny skin incisions. Stitches are not used, and the tiny incisions are pulled together with sterile paper-tape or steri-strips. Recovery is generally brief and uneventful. Vein stripping and ligation has been the traditional treatment for bad valves, in the largest the largest surface veins for nearly 100 years. Typically, the great saphenous vein above the knee is stripped (removed), usually through small incision using an atraumatic technique (inversion stripping). Usually only small incisions are required. Stripping is frequently done in conjunction with ambulatory phlebectomy. The entire surgery is safely performed under general, epidural, or local anesthesia and can be performed in an outpatient setting. Laser treatments use a fine optical fiber, which is advanced through a catheter into the saphenous vein. Laser energy, in the form of heat, is then delivered through the fiber. As the fiber makes contact with the blood and inner wall of the vein and, as the fiber is slowly withdrawn, the laser energy is absorbed by the blood and vein tissue, sealing it shut. This is a minimally invasive procedure that can be performed in a doctor’s office or outpatient setting with local anesthesia. Recovery is usually fast and uncomplicated. Radiofrequency (RF) treatment involves the direct controlled delivery of energy to a vein wall by a small RF probe. This causes collagen in the vein wall to shrink and the vein to close and become sealed off. RF treatment is also a minimally invasive procedure that can be performed in a doctor’s office or outpatient setting. Recovery is typically brief and uneventful. You can’t do anything about your heredity, age, or gender. However, you can help delay the development of varicose veins or keep them from progressing. Be active. Moving leg muscles keeps the blood flowing. Keep your blood pressure under control. Work with your doctor. To temporarily relieve symptoms, lie down and raise your legs at least six inches above the level of your heart. Do this for ten minutes a few times each day. Strive for a normal weight. Wear your prescription compression stockings as specified by your doctor. See a qualified doctor who can diagnose the cause of your varicose veins, the sources of venous reflux in your legs, and offer a variety of treatment options.